This model is known to run in OpenCell and COR to reproduce the published results. Units have been checked. COR reports they are balanced and consistent while OpenCell is reporting some inconsistencies. OpenCell is currently having unit "issues" and we believe the units are correct in this CellML model. ABSTRACT: Action potential repolarization in the mammalian heart is governed by interactions of a number of time- and voltage-dependent channel-mediated currents, as well as contributions from the Na+/Ca2+ exchanger and the Na+/K+ pump. Recent work has shown that one of the K+ currents (HERG) which contributes to repolarization in mammalian ventricle is a locus at which a number of point mutations can have significant functional consequences. In addition, the remarkable sensitivity of this K+ channel isoform to inhibition by a variety of pharmacological agents and clinical drugs has resulted in HERG being a major focus for Safety Pharmacology requirements. For these reasons we and others have attempted to define the functional role for HERG-mediated K+ currents in repolarization of the action potential in the human ventricle. Here, we describe and evaluate changes in the formulations for two K+ currents, IK1 and HERG (or IK,r), within the framework of ten Tusscher model of the human ventricular action potential. In this computational study, new mathematical formulations for the two nonlinear K+ conductances, IK1 and HERG, have been developed based upon experimental data obtained from electrophysiological studies of excised human ventricular tissue and/or myocytes. The resulting mathematical model provides much improved simulations of the relative sizes and time courses of the K+ currents which modulate repolarization. Our new formulation represents an important first step in defining the mechanism(s) of repolarization of the membrane action potential in the human ventricle. Our overall goal is to understand the genesis of the T-wave of the human electrocardiogram. 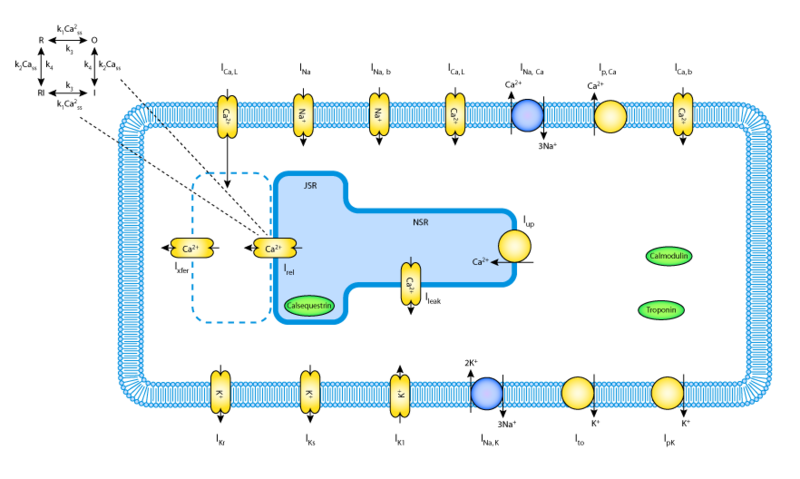 A schematic diagram describing the ion movement across the cell surface membrane and the sarcoplasmic reticulum, which are described by the Fink et al. 2008 mathematical model of the human ventricular myocyte. Derived from workspace Fink, Noble, Virag, Varro, Giles, 2008 at changeset 0628c5ca2f03.